اسطوانة الصيانة SystemRescueCD هى الاسطوانة المتخصصة فى إصلاح وصيانة الهارد ديسك وحل كل مشاكل الهارد من إعادة تقسيم الهارد أو تكبير وتصغير حجم البارتشنات. أيضا باستخدام اسطوانة الصيانة SystemRescueCD يمكنك الدخول لجهازك فى حالة انهيار النظام وإنقاذ الملفات الهامة قبل فقدانها، وتستطيع عمل إصلاح وصيانة شاملة للجهاز. 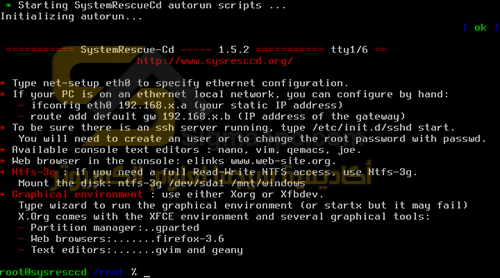 اسطوانة الصيانة SystemRescueCD بها العديد من الأدوات التى تمكنك من مكافحة الفيروسات والتخلص من جميع أنواع الفيروسات المصاب بها جهازك وأيضا فحص وإزالة الملفات والبرمجيات الخبيثة التى تضر بالجهاز والنظام. متخصصة فى مجال إصلاح الهاردديسك. الدخول للجهاز فى حالة انهيار النظام الأساسي. تحتوى على العديد من الأدوات الهامة. 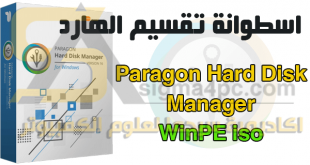 أيزو للحرق المباشر على فلاشة USB أو CD. صغيرة الحجم بحيث يمكن حرقها على اسطوانة CD. 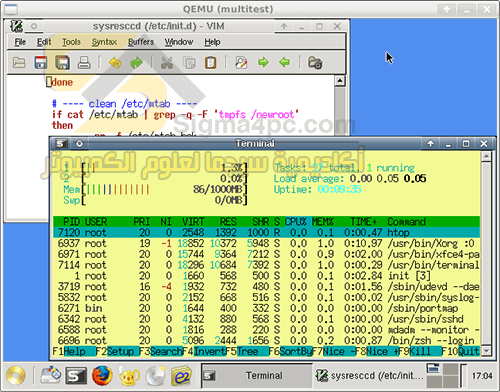 The current version is based on the Long-Term-Supported linux-4.4 kernel. The precompiled kernel includes a lot of drivers, in order to work for most users. Here is a short description of some of the recovery tools. 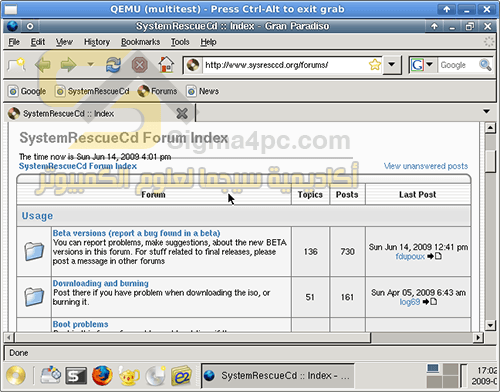 a partition table tool. Save/restore partition table to/from a file. Use it before and after changing partitions or like right now to save partition definitions. 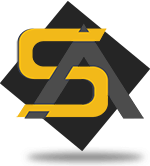 it’s a flexible system tool that allows you to save the contents of a file-system to a compressed archive file. The file-system can be restored on a partition which has a different size and it can be restored on a different file-system. It provides multi-threading compression and supports lzma compression (very high compression level) as well as lzo, gzip and bzip2. Everything is checksummed in the archive in order to protect the data. It supports all the linux-filesystems including ext4 so you should use it if you are interested in linux backups. This program can also be used to clone ntfs partitions. It’s a disk imaging software. It can be used for backups and hard drive recovery since it works at the block level. Used blocks of a partition are saved to a compressed image file. It can be used to restore your system or data after a hard drive crash or after accidental deletion of data. Popular disk recovery software. 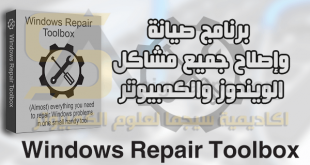 Recovers lost partitions and repairs unbootable systems by repairing boot sectors. It can also be used to recover deleted files from FAT, NTFS and ext2 filesystems. 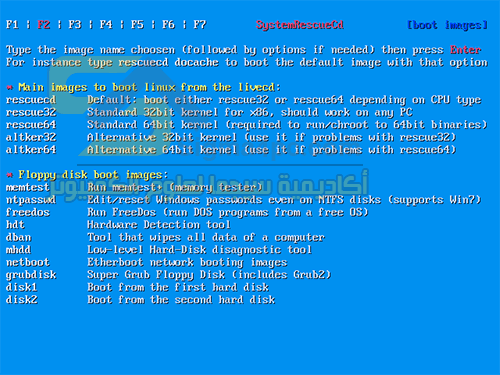 File system recovery is supported for reiserfs, ntfs, fat32, ext2/3 and many others. Another data recovery software focused on lost files including video, photos, documents and archives. an extended ftp client to send them off to another system. 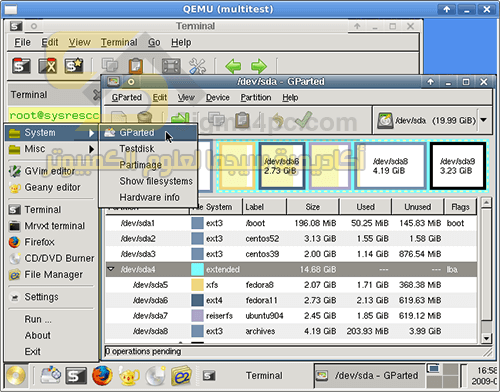 Graphical partition editor displays, checks, resizes, copies, moves, creates, formats, deletes, and modifies partitions. 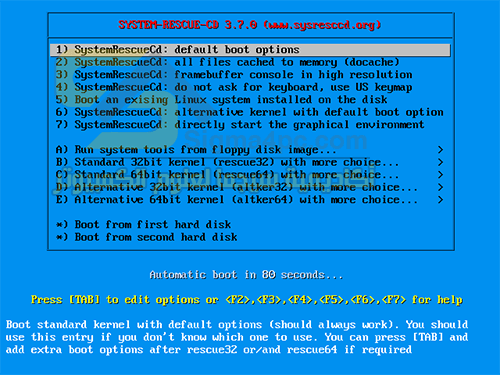 Multi Bootloaders Install or restore bootloader. If Microsoft Windows removed a multi bootloader, run it from this CD, and reinstall it. Each file system has its own tools. For example XFS provides xfsprogs. It allows the user to format an existing partition, to resize another one,… We provide reiserfsprogs for ReiserFS, Reiser4progs, xfsprogs for XFS, jfsprogs for JFS, e2fsprogs for ext2/ext3/ext4, ntfsprogs and ntfs-3g-AR for NTFS, dosfstools for FAT/VFAT. tar/gzip/bzip2 are provided for Unix users. zip/unzip, rar/unrar/unace for Microsoft Windows users. 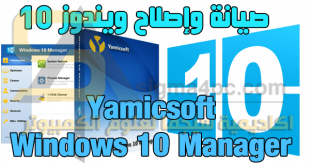 It allows users to backup/restore their data from this bootable disc. Dar (Disk Archiver) It’s like tar but it’s a lot more powerful. 7z (=7zip) which is used on Unix and on Microsoft Windows is also provided. During a system rescue, you may need to edit system files. nano (a lightweight editor), vim (VI Improved), qemacs (emacs clone) and joe are included. Geany, a graphical text editor for X windows is also available. cdrecord is a package that comes with mkisofs. It is the linux standard CD burning command from console. Mkisofs allows you to create an ISO image file to use with cdrecord. Cdw is a text based front end to make cdrecord and mkisofs easier to use. Udftools are provided for packet writing. Now, you can also use dvd+rwtools. elinks (from X terminal). Useful for viewing documentation during recovery of the system. 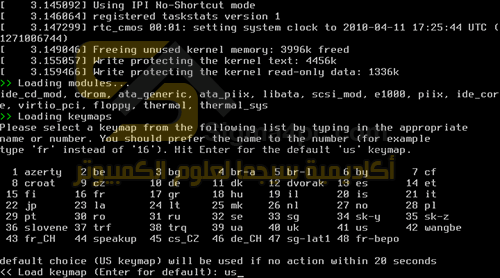 Aida a powerful hardware enumeration/diagnostic/discovery tool (as sandra). Details components like type of video subsystem, NIC and memory specifics. MHDD low-level Hard Disk Drive Diagnostic. Reports S.M.A.R.T. data, firmware errorlog, runs firmware tests, scans surface reporting access times per sector and much more. 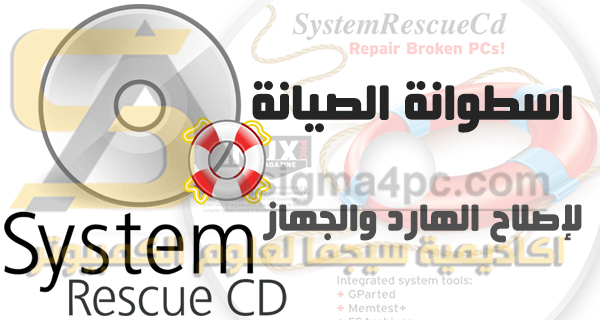 تم تحديث اسطوانة الصيانة SystemRescueCD إلى الإصدار 6.0.1 مجاناً.